Working more regularly at the bench produces momentum. New ideas pop up, but old projects resurface as well. Suddenly the issue that stymied me before may disappear as a solution presents itself. 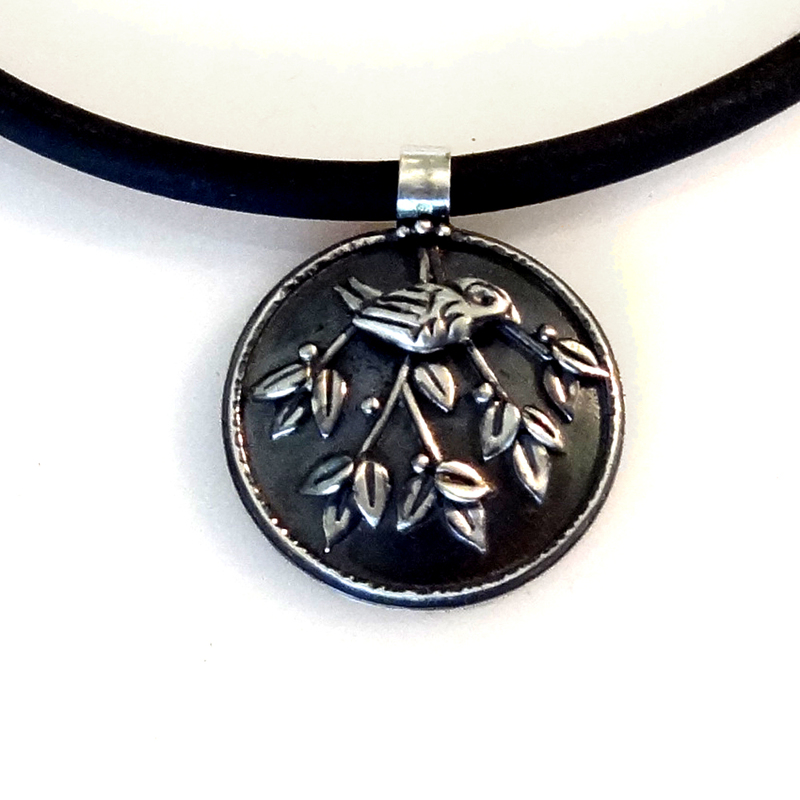 The original bail design for this pendant didn't work the way I wanted, so I'd removed it and cast the piece aside. Today, one of the many bits lying on the bench surface caught my eye - a simple slice of tubing, that with a couple of strokes of a file could be made to fit nicely along the edge of the domed full moon pendant. It took a couple of tries to figure out how to hold everything securely while soldering the tube in place, but eventually I remembered enough tricks: holding the pendant vertically with a third hand, using super glue to temporarily hold the bail exactly where I wanted it, and placing a tripod on top for light pressure to keep the bail steady while the solder melted. I like it hanging on a simple black rubber cord. Now I just need to work on the coordinating clasp. Actually, I learned the super glue trick from Kate Wolf, although I've since had Ronda recommend it as well. Kate researched it with the manufacturer to make sure it wasn't toxic in the flame (chemist me asked - there is possible cyanide in there). Evidently all the nasty stuff is already gone during the curing.